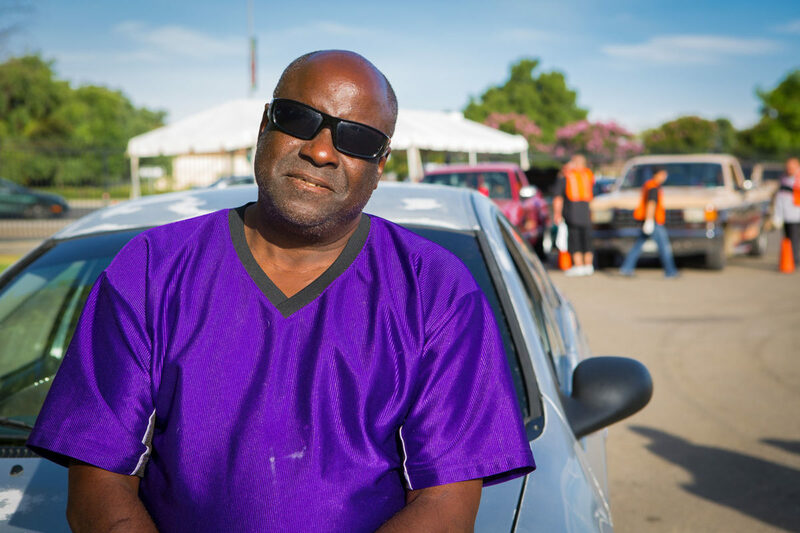 Veteran Dwight Nelson’s Silver Dodge finally passed a free smog test at a Tune Up event in Stockton. Low-income families save money replacing old gas-guzzlers. Richard Gonzales stands, stretching his legs outside his white 1992 Ford pickup in the burning hot parking lot at the San Joaquin Fairgrounds in Stockton. Gonzales is one of 528 people who showed up before the gates to the lot opened at 6:20 a.m. on this Saturday morning for a “Tune In Tune Up” event, where Central Valley residents can get a free smog test and may qualify for smog repairs or a variety of major incentives to replace old vehicles with cleaner, more fuel-efficient vehicles, including plug-in hybrid and electric vehicles. Drivers started lining up at 4:40 p.m. the day before the event and more than 50 people camped overnight. With hundreds participating and a waiting list for people who want to retire their cars, “this has to run like a well-oiled machine,” remarks the cheerful Jose Marin, outreach coordinator for the non-profit Valley CAN (Valley Clean Air Now), which administers the program. And it is extremely well coordinated. California Highway Patrol cadets volunteer to patrol both the night before and the day of the event. Mechanics in training from the local community college run the smog tests. “Our future smog testers,” Jose says. Created by the California Air Resources Board in response to laws authored by Senators Kevin de León and Fran Pavley, and funded by fees paid by polluters under California’s climate justice and clean energy laws, the Central Valley pilot project provides a way for the lowest-income families to upgrade to the very cleanest cars. Under this program, for example, a family that meets the income guidelines can receive $9,500 toward the purchase of a used plug-in hybrid, like a Chevy Volt, or an all-electric car, like the Nissan LEAF. Also, in the case of either a brand new plug-in hybrid or electric car, low and moderate income consumers will be eligible for an additional $3,000 and $4,000, respectively, from a separate program, known as the Clean Vehicle Rebate Project. Drivers who scrap an old, dirty car but choose not to replace it are also eligible for vouchers for public transit passes or participating car-sharing services — between $2,500 and $4,500 in value, depending on their income level — to help achieve healthier air in one of the nation’s highest air-pollution areas. More than 500 Central Valley residents wait in line at a Tune Up event to receive vouchers to fix emissions issues on their cars. They may also qualify for rebates to purchase cleaner cars. 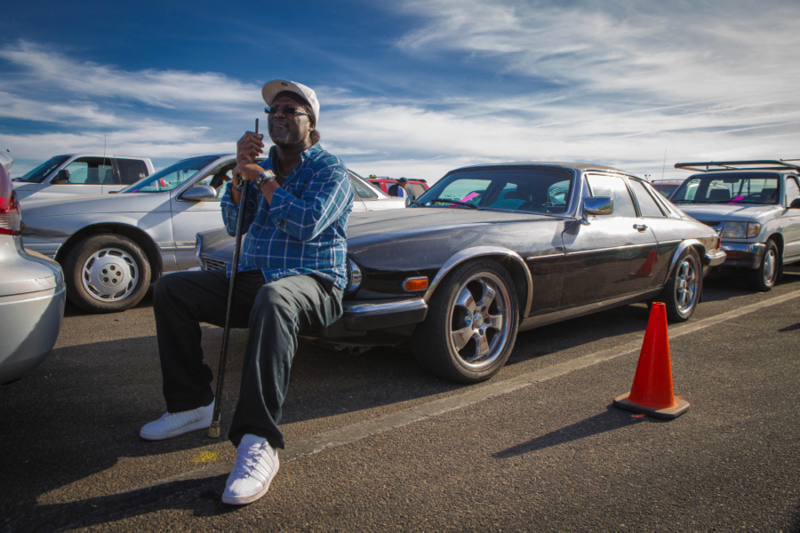 At 7:30 a.m. some people are sleeping in their cars in the fairgrounds parking lot waiting in line for the smog test. Surveyors go through the lines of cars in the parking lot with an iPad, capturing the driver’s basic information: Name, car make and model, license plate. They survey them about their finances enough to know whether they qualify for incentives to help them replace their car with a clean vehicle. Surveyors speak fluent Spanish and can conduct the survey in Spanish or English. Gonzales says he has failed the smog test twice, once because he didn’t have a gas cap and another time because of a timing belt issue. All varieties of vehicles and their owners fill the lanes— a bright mustard colored Firebird, a beige Winnebago. Gonzales’ daughter is two rows over with a van. People have their radios going and their car doors open while they wait, so it feels a bit like tailgating. “Yeah, I’m free falling,” a young couple sings along, with their feet propped up on the dash. Fernando Ruiz, in a 1989 Toyota Camry, answers the survey questions. Yes, the car is registered, he says. (Many are not because you can only register a car if it passes the smog test.) At home, Fernando has a 2008 Dodge Avenger. He drives more than 60 minutes to work and spends $60 a week on gas. Yes, he can afford a $200 a month payment and can qualify for a loan. Yes, he has a job. He has five dependents. Yes, his income is below the program threshold. As a result of his answers, Fernando gets an orange tag under his windshield wiper. This indicates that based on the survey, he can qualify to retire and replace his car. Once he’s done with his smog test, if he fails, Valley CAN will talk to him about upgrading his car. The very first car to get a smog test today is a silver Dodge that belongs to Dwight Nelson. It did not pass a smog test earlier and he got a $500 voucher to fix it. This time it passed. Dwight is a veteran who served in the Navy in 1978, stationed at Treasure Island. He’s lived along the coast from Anchorage to San Diego, working construction. “It was a time of adventure,” he said. He’s retired now. He has neuropathy in both legs and has had surgery and regularly visits the VA hospital. He’s in favor of clean vehicles because of air pollution. He heard about the Tune Up event on the radio (100.1—an oldies station). He says he enjoyed hanging out in the line waiting to get in and caught up with friends over night. “I know so many people in Stockton,” he says. Further back in the line awaiting the smog test, Harley Medin, a young, tattooed man with tufts of facial hair, giant crystal plugs in his ears and a chain attached to his wallet in his front pocket, stands outside his 1986 Cutlass Supreme smoking a Newport. The car has wine-colored crushed velvet seats. It’s a “classic” car, he says, which unfortunately got impounded for not having any tags. He explains that he was on his way to the smog-testing place when he got pulled over. He now has to pay a hefty fine, but if he gets it tested and passes, the fine will drop. Juan Sanchez drives a 1991 Tercel. His son, about nine, squirms around in the passenger seat as they near the smog test. He has four people in his household. He needs tags for the old Tercel and has to pass the test first. He drives 45 minutes round-trip for work and spends about $30-$40 a week on gas, on top of about $1,000 a year on repairs. He tells the surveyor he can afford a $200 car payment and he believes he can qualify for a $5,000 loan. He has a valid driver’s license and a regular paycheck from working on a ranch. All these details mean he qualifies for the vehicle retirement program, and he’s very interested in an electric vehicle for the gas savings. 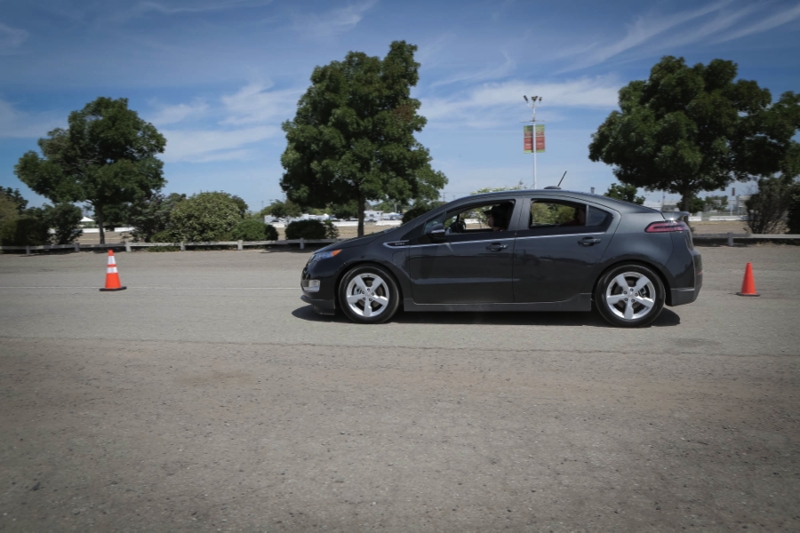 Valley CAN arranged a test drive course at the fairgrounds on this particular Saturday, where Tune Up participants could test drive a Chevy Volt, Chevy Spark EV and an electric Fiat. One family that traded in a high-emissions vehicle for a plug-in hybrid through the program, the Mendoza family from Stockton, is very happy they did. Jose Mendoza travels several times a month to University of California San Francisco for treatment for pulmonary hypertension. He and his wife Lorena have six girls, all honor students, who travel to play competitive soccer across the state. Jose drives them to school and to all their games, and until May 27th, they made their trips in a 1984 Ford Ranger that has repeatedly failed its emissions tests. The Mendozas weren’t able to afford to fix the truck so that it would pass the smog test and it was contributing to Stockton’s serious air pollution. After attending a Tune In Tune Up event in February, the Mendoza family scrapped their old truck and now drive a 2013 plug-in hybrid Prius. The Mendozas can now put the $125 per month they spent for recurring repairs toward financing the clean and fuel-efficient car while their fuel costs drop from $245 to $83 a month.